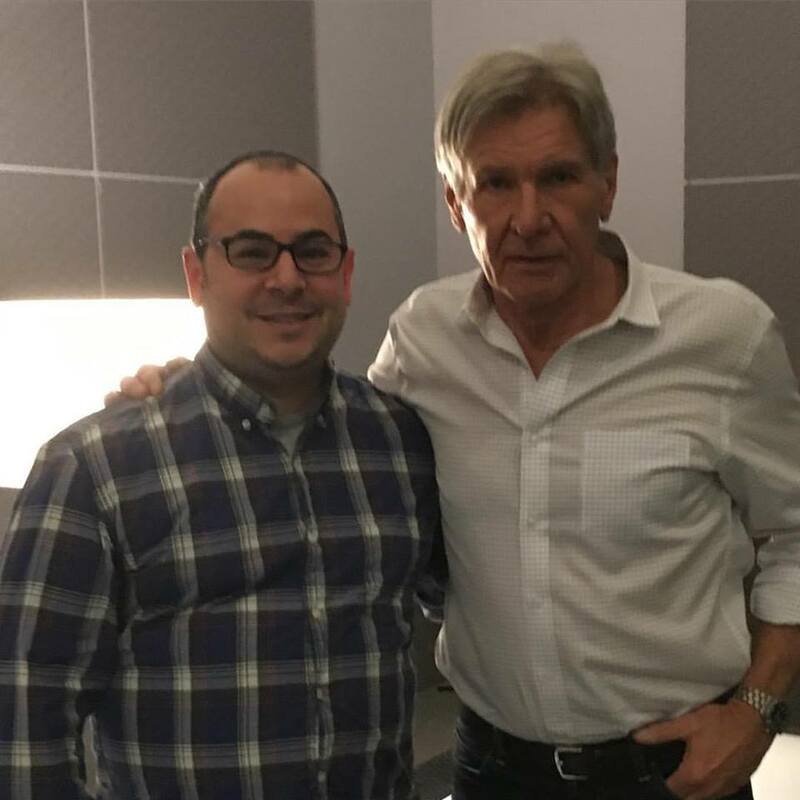 When I read that a former colleague of mine, Germain Lussier, had interviewed Harrison Ford – among other leading lights from the new “Star Wars” movie – I could not think of a more worthy person to celebrate such a professional milestone. 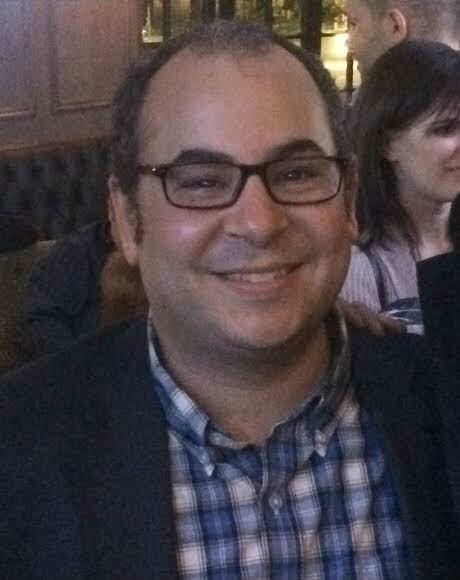 I knew Germain from my time as an editor at The Times Herald-Record in Middletown, N.Y. I was a news editor and he was an entertainment/features reporter. He was quiet, diligent and dedicated. And above all, he was passionate about his craft and the beat he covered. He pulled up stakes from his native New York to California for what he thought would be a career at a national magazine. As you will read below, things took a different turn. Germain graciously agreed to this Q/A for About Men Radio. Apart from sharing in his reflective glory of rubbing elbows with Harrison friggin’ Ford (! ), I wanted to tell his story because it is an excellent reminder to us all to pursue our passions with all our might. There’s no telling the places you’ll go or the people you will meet. Work does not have to be drudgery. It can be a labor of love – something that Germain exemplifies here. I grew up in Monroe, N.Y.
And from as early as I can remember, I wanted to be a movie critic. I thought getting paid to watch movies would be the best job in the world. As I got older, I realized that there were other ways to do that too. So I went to New York University and majored in Cinema Studies, where I just studied, analyzed and wrote about film and film history. That led me to internships with magazines such as Premiere, Us Weekly and Entertainment Weekly. Eventually, I got a job as an entertainment reporter at my local newspaper, The Times Herald-Record. I worked there for six years before deciding I wanted to move away from where I grew up. So I moved to Los Angeles and found a niche working on movie blogs. For five years I worked on a site called Slashfilm and was able to write about movie news every single day, visit the sets of films like “Rise of the Planet of the Apes,” “Anchorman 2,” “Ender’s Game” and so many more. It was a dream come true. After a few years though, I got an offer to move to a bigger site, io9.com, and that’s where I am now. Tell us about your passion for films: What are its roots and what is it about movies that fascinates you? Honestly, I don’t know where my love for film comes from. Neither of my parents love movies that much, but somehow by the age of 8 or so I already knew what I wanted to be when I grew up. Now though, the passion comes from so many places. First, the ability to go into a dark theater and be transported somewhere else emotionally never ever gets old. Also, when you write about movies you have something new and exciting to look forward to every single week. There are always new movies. Of course some are more highly anticipated than others but there’s always something exciting on the horizon. Tell us about your current position at io9.com: How long have you been there, your title and duties. I moved to California in June of 2009. I started working at Slashfilm in September of 2010 and I started at io9 in June of 2015. On the site, I’m the primary entertainment reporter, meaning if there’s news or an assignment having to do with movies or TV, I usually get first crack at it. On a daily basis, I’m expected to write however many news stories are necessary and develop longer feature stories, which can be about almost anything. Tell us about what led up to securing one-on-one interviews with the leading players connected to “The Force Awakens,” including Harrison Ford: How did that come about? Everything lead up to it. Seriously. I’ve been a “Star Wars” freak for as long as I can remember. It was anticipation of Episode I that led me into the depths of the Internet and familiarized me with the websites that would become my livelihood a decade later. It was those “Star Wars” websites that gave me my first opportunities as a college student to get a glimpse of the life of a Hollywood journalist. My college graduation was in May 2002, the day Episode II was released in theaters and on that day, I set a goal for myself to be working somewhere I’d be able to write about the next movie, Episode III. That happened in 2005 at The Times Herald-Record. And ever since 2012, when Disney bought Lucasfilm and Star Wars, I had been developing relationships with people at that studio and in the industry not ONLY to prime myself for this event, but it was always on my mind. So, as we got close to the release of the movie and I was invited to cover the press junket, I requested interviews with every single actor and filmmaker available. I expected to maybe get one or two and I knew Harrison Ford was a long shot. But, those relationships and my unrelenting passion for the franchise got me not just one interview, but five (four on the day as one got cancelled), including Ford. And talking to Ford was a dream come true. As long as I’ve been a “Star Wars” fan, I’ve been a bigger Han Solo fan. I also love Indiana Jones, so he’s always been my favorite actor and kind of an idol. Plus, I collect Han Solo stuff so Harrison Ford is never too far from my face. So actually getting to sit down with him was kind of a culmination of everything both in my personal and professional life, stuffed into eight short minutes. Describe the interviews themselves. You openly expressed a certain disbelief that they were happening/did happen. What were those moments like for you? These interviews are always extremely weird. They take place in very sterile environments (hotels, offices, etc.) and are kind of an assembly line as a star sits in a room and then a string of journalists just walk in, talk to them, and leave. For “Star Wars,” it was even odder as we were at a massive convention center and the interview rooms were bigger than most houses. So you’d wait outside, walk in, sit on a white couch and talk for 8-10 minutes. And even more odd, with “Star Wars,” it’s the first press junket I’ve ever done without seeing the movie. Sometimes there are “long lead” days where a company will show you a few minutes of a movie and then you do interviews but a week away from release, you always see the movie so you have something to talk to the actors about. With “Star Wars,” you hadn’t seen anything and they were unable to talk about anything directly related to the movie. It made for an interesting challenge. Thankfully, I’ve been following this film since the second it was announced — literally — and I had plenty of questions for the likes of J.J. Abrams, Oscar Isaac, Gwendoline Christie and Mr. Ford. Things only got weird on a few occasions with Isaac and Christie when they told me they weren’t allowed to answer a few questions. I think my disbelief at being there was just kind of the resonance of feeling that so much of my life had led to this. You have posted video of how you turned over your apartment to just about every piece of “Star Wars” memorabilia you own. As such a diehard fan and as a film critic, what are your expectations and hopes for the new movie? My hopes are for something that makes me feel the way I do when I still watch the originals. Those are my expectations too. I just want it to be something that’s worthy of “Star Wars,” that spawns conversation and answers questions I’ve had for decades about what happens next. I mean I was ULTRA excited for the prequels. I saw “The Phantom Menace” nine times in the theater I was so hyped for it. But with those movies, ultimately, you knew how they had to end. Anakin becomes Darth Vader and his kids get separated. We don’t know how it’s going to end, who the characters are, etc. And that infinite possibility just gives me goosebumps.